Why is Jollibee Called Jollibee? Jollibee is a Filipino multinational chain of fast food restaurants. If you’re from the U.S., there’s a decent chance you’ve never been to a Jollibee – it only has 35 U.S. locations, most of which are in California. However, if you’ve ever been to the Philippines, you’ve definitely heard of it. Jollibee is the largest fast food chain in the Philippines with a nationwide network of over 950 stores. It holds more local market share than all other multinational brands combined. When I went to Manila this past June, that was abundantly clear – there seemed to be a Jollibee on every corner! 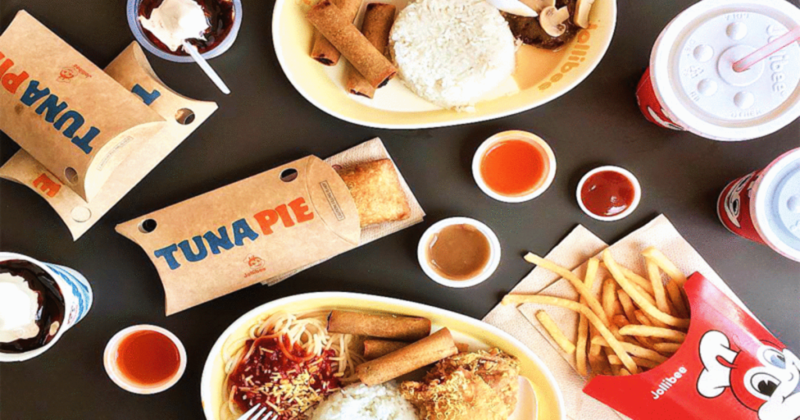 From its smiling anthropomorphic bee mascot, to its wide range of menu items (including sweet Filipino-style spaghetti, burgers, fried chicken called Chickenjoy, and the overwhelming Halo-halo dessert that’s a mix of just about everything sweet), to its surprisingly emotional commercials, there’s really nothing quite like it. To know Jollibee is to love it. Why is it Called Jollibee? Jollibee’s CEO Tony Tan Caktiong came from a poor family from southeastern China. He and his family migrated to the Philippines to seek a better life. In 1975, 22-year-old Tony used family savings to open a Magnolia Ice Cream parlor in Cubao, Quezon City. The franchise was very successful. At the advice of management consultant Manuel Lumba, they started offering hot meals and sandwiches to reach a larger market. Quickly, they realized that the food they sold was more popular than the franchise’s ice cream. They cancelled the Magnolia franchise three years later and converted the ice cream parlors into fast food restaurants. At the time, there weren’t any McDonald’s restaurants in the Philippines – in fact, there were no full-service restaurants serving hamburgers. Tony made up the name Jolibe for his new restaurant. The name Jollibee came from Lumba – instead of throwing the made-up name away, he changed the spelling to give it a new meaning and a mascot: a Jolly Bee. Lumba designed the first version of the Jollibee mascot taking inspiration from comic books, Mickey Mouse, and Ronald McDonald. He and Tony decided on a bee mascot to represent the Filipino people: hard-working, good-hearted, and happy, even though they’re busy. SEE ALSO: Why is Applebee’s Called Applebee’s? Jollibee started franchising after one year and experienced rapid growth. Miraculously, it was able to not just withstand the entrance of McDonald’s to the Philippines in 1981, but to even win against it. In 2002, an article in The Economist put it this way: “If McDonald’s is the Goliath of fast food, Tony Tan’s Jollibee is its Filipino David.” Today, there are nearly twice as many Jollibee locations as McDonald’s locations in the Philippines. Jollibee has effectively won the fast-food war there. Currently there are over 1,100 Jollibee locations worldwide, most of which are in neighborhoods with high concentrations of Filipinos. Still, Jollibee plans to continue expanding globally. They just might make it to your neighborhood – but if they don’t, you can always check out a Smashburger instead. Jollibee owns 85% stake in the company! Have you ever been to Jollibee? What’s your favorite menu item? Let us know in the comments!